It's Sunday, which means it's time to take a look in my mailbox and see what books arrived... (Kristi at The Story Siren hosts In My Mailbox - head over there for this week's roundup!). Saraswati's Way by Monika Schroder (Farrar, Straus & Giroux, 2010). 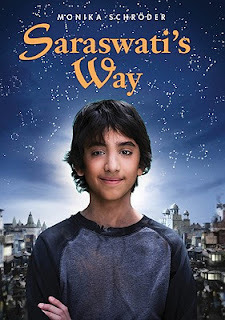 Twelve-year-old Akash knows that there is nothing he can do to change his situation. It doesn't matter how easily he can find patterns of numbers in his head, or how badly he wants to know more than he will ever be able to learn from the village math teacher, Mr. Sudhir. If the gods wanted a poor Indian boy to get a scholarship to go to the city school, it would happen. At least that's what Akash has always been told. So Akash prays to the one god he thinks might be on his side - Saraswati, the goddess of knowledge and wisdom. But it seems even Saraswati doesn't want Akash to succeed. And when things in his home life take a dreadful turn for the worse, he suddenly finds himself given away like the runt of the litter to work off his family's debt in the landlord's quarry. Now Akash must make a decision. Should he leave his fate in the hands of the gods, or fight to take charge of his own life? Sounds like a great book and I'm excited to read it! How about you? What did you get in your mailbox?